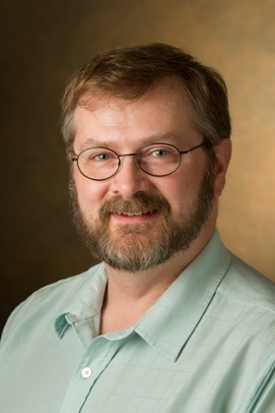 Accomplished teacher-scholar Michael Shaw, PhD, professor of chemistry in the Southern Illinois University Edwardsville College of Arts and Sciences, has achieved the rank of Distinguished Research Professor for his outstanding and sustained contributions to electrochemistry. The distinction is the highest academic rank a faculty member at SIUE can achieve. It is awarded to a prestigious group of tenured faculty members in recognition of significant contributions to research and creative activities. Shaw’s research contributions are in the areas of exploring metal-mediated transformations, developing experimental data collection methods, developing and curating strategies for data collection in the electrochemical field, and devising programs for data analysis. His impressive publication and product output includes 32 peer-refereed journal articles and two patents. Shaw has also received funding as principal investigator or co-principal investigator on six National Science Foundation grants totaling more than $2.15 million in funding, with just over $1.4 million to SIUE to enrich the student research environment. “Every tool that is developed to study chemistry opens up a new world of discoveries,” Shaw said. “In my own training, I always found that deeper knowledge of how chemistry and electricity interact yielded insight into the behavior of molecules. For me, the further down the electrochemical rabbit hole I go, the more I can find new, interesting and potentially useful chemistry. Whether in theory, methodology or applications in chemistry, the acclaimed researcher’s contributions to his field are notable. Equally noticed by colleagues is his inspiring dedication to collaboration and the teacher-scholar philosophy. “In all my years as a professor, I have never seen someone so dedicated to providing research opportunities for students,” one colleague said. Shaw considers himself a curator and promoter of the body of work he has produced with students, collaborators and colleagues throughout his nearly 20-year tenure with SIUE. “Teaching and research are mutually supportive goals,” he concluded. “A teacher-scholar includes students in the research world, so as to benefit from their energy and drive to accomplish the dual goals of training technically qualified individuals and fulfilling research objectives. Recipients of the Distinguished Research Professor honor are provided one semester of time devoted to research, along with a $1,000 increase in their academic year base salary. They also receive a medallion to be worn with their academic regalia, and their name is placed on a plaque displayed in Rendleman Hall. Photo: Dr. Michael Shaw, professor of chemistry in the SIUE College of Arts and Sciences, achieves the Distinguished Research Professor rank.